Review of Eric Metaxas, Bonhoeffer: Pastor, Martyr, Prophet, Spy: A Righteous Gentile vs. the Third Reich (Nashville: Thomas Nelson, 2010), pp. 608, ISBN 1595551387. This is a badly flawed book. On one level it is simply a popular retelling of Bonhoeffer’s life drawn from familiar sources such as the Dietrich Bonhoeffer Works English edition, the Bethge biography, and Love Letters from Cell 92. Metaxas has also looked at the outtakes of the Doblmeier documentary interviews with Bonhoeffer’s students, so there are a few new anecdotes here. Much of the book, however, is a familiar patchwork of lengthy direct citations from the DBWE volumes, the Bethge biography, and Love Letters. It is also a consciously evangelical (in the U. S. context) interpretation of Bonhoeffer, his life, and times. Neither of these factors are obstacles per se to a good new look at Bonhoeffer. A shorter biography of Bonhoeffer for the general audience is long overdue, and this one is readable enough. And there is certainly room for an evangelical examination of Bonhoeffer’s theological development in the context of his life and times. Bonhoeffer’s spirituality, his eloquent articulation of the life of discipleship in the world, and his powerful witness have always given him a wide following among evangelicals, and the trajectory of his theological and political development definitely has the character of a spiritual journey. A solid evangelical examination of Bonhoeffer in the historical context of what was happening to churches and theologians, both in this country and in Germany, would be fascinating—particularly if it dealt with the still under-researched discussions about Nazism that occurred among Baptists, Pentecostals and others at the evangelical end of the spectrum. Unfortunately, that’s not the book Metaxas has written. There are two central problems here. The first is that he has a very shaky grasp of the political, theological, and ecumenical history of the period. Hence he has pieced together the historical and theological backdrop for the Bonhoeffer story using examples from various works, sometimes completely out of context and often without understanding their meaning. He focuses too much on minor details and overlooks some of the major ones (such as the role of the Lutheran bishops and the “intact” churches). 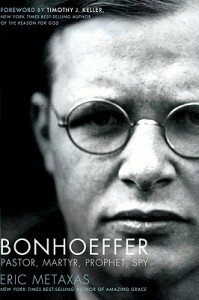 The second is that theologically, the book is a polemic, written to make the case that Bonhoeffer was in reality an evangelical Christian whose battle was not just against the Nazis but all the liberal Christians who enabled them (in fact, Metaxas is much kinder to the secular humanists, but that’s probably because they were members of the Bonhoeffer family). The result is a terrible oversimplification and at times misinterpretation of Bonhoeffer’s thought, the theological and ecclesial world of his times, and the history of Nazi Germany. There are numerous errors, some small, some rather stunning. The most glaring errors occur in his account of the church struggle, which is portrayed as the battle between the Nazi-controlled German Christians against Dietrich Bonhoeffer, who here leads the Confessing Church together with Martin Niemoeller. In Metaxas’ version, the Barmen declaration repudiates Nazi anti-Semitism, the Confessing Church breaks away from the Reich Church, and the neutral or intact churches are completely absent from the scene (there are not even index entries for Bishops Wurm, Marahrens, or Meiser, the last of whom is referred to but not named). Bonhoeffer of course leads the way, both in the name of true Christianity and on behalf of the Jews. This oversimplification of the battle lines and the complexities of the church struggle (and of Bonhoeffer himself) characterizes the portrayal of the entire period. National Socialism and its leaders are of course unambiguously anti-Christian. Most of the generals in the resistance against Hitler, we learn, are “serious Christians”. Luther’s anti-Semitism is attributed to his digestive troubles, and Metaxas does not address how anti-Semitism, whatever its source, had permeated the mindset of German Protestantism and the wider culture. There is a brief nod to the fact that Franz Hildebrandt is Christian but of Jewish descent according to the racial laws. Elsewhere, however, there is little distinction between converted Jews and secular or observant Jews, and his entire discussion of the persecution of the Jews and the churches’ responses is clueless. In some places it is offensive, as when Metaxas argues that supporters of the Aryan paragraph were not really anti-Semitic: “Some believed that an ethnically Jewish person who was honestly converted to Christian faith should be part of a church composed of other converted Jews. Many sincere white American Christians felt that way about Christians of other races until just a few decades ago.” (Why, some of their best friends …). Along the way Metaxas inserts shorthand summaries that range from the silly (Luther as “the Catholic monk who invented Protestantism”) to the bizarre (the difference between Barth and Harnack is compared to contemporary debates “between strict Darwinian evolutionists and advocates of so-called Intelligent Design”). All of this, however, leads to a selective misreading of Bonhoeffer’s theological development and a profound misunderstanding of what happened to the German churches between 1933 and 1945. The failure of the GermanEvangelicalChurchunder Nazism was not that it was filled with formalistic, legalistic Lutherans who just needed to form a personal relationship to Jesus, but that it was filled with Christians whose understanding of their faith had so converged with German national culture that it tainted both their politics and their theology. (As an interesting aside, when I first interviewed Eberhard Bethge in 1985 he explicitly compared this kind of Protestantism to what he had seen of the American religious right. A thoughtful evangelical reading of the development of Bonhoeffer’s extensive writings on the church-state relationship and the public role of religion would be a major contribution to the field, but Metaxas doesn’t even mention that aspect of Bonhoeffer’s thought). What Metaxas fails to grasp is that there were many devout, well-educated, Bible-reading Christians in Germany who read their Losung each morning and fully supported National Socialism. Well. There’s something going on here, but it doesn’t have much to do with real history and it’s certainly not Bonhoeffer. This book is clearly intended as theological biography, but it fails because Bonhoeffer’s theology cannot be read ahistorically (as Andrew Chandler’s astutely noted in his 2003 review of the Bonhoeffer Werke, “The Quest for the Historical Bonhoeffer”), and it certainly can’t be understood without addressing the complexities of Bonhoeffer’s thought as he struggled with the realities of his times. That, in fact, is both the challenge and the potential for reading Bonhoeffer. Looking at Bonhoeffer in historical context removes him from any narrow theological box, evangelical or liberal. Bonhoeffer was deeply pious in a way that some liberal Christians (again, in the contemporary U.S. sense of that word) might find hard to connect with and it’s that piety that speaks directly to evangelicals around the world. At the same time, he was a highly intellectual and critical Christian, and therein lies his appeal for Christians on other points of the spectrum. More importantly, Bonhoeffer had witnessed firsthand what happens when faith and ideology converge. Thus, during the dark war years, when some church leaders, including his ecumenical colleagues, called for a “rechristianization” of Europe and a return to Christian values, Bonhoeffer explicitly repudiated it, both in Ethics and in his prison letters. He also warned his students at Finkenwalde against the dangers of an individualistic “personal relationship” to Christ. Bonhoeffer’s central concern remained the life of Christian faith in the world, yet his understanding of Christianity had been shaken and altered by the failures of his church under Nazism. In 1942 he wrote of “a Christendom enmeshed in guilt beyond all measure” and I personally think that any interpretation of his famous discussion of “religionless Christianity” needs to start there. A thoughtful and honest evangelical analysis of the complete Bonhoeffer, not just the parts that go down easy, would be useful. But Metaxas has simply pulled together the passages he likes and ignored anything that might complicate the picture he wants to create—the same thing of which he accuses others, when he writes on page 466: “Many outré theological fashions have subsequently tried to claim Bonhoeffer as their own and have ignored much of his oeuvre to do so … (they) have made of these few skeletal fragments something like a theological Piltdown man, a jerry-built but sincerely believed hoax.” Yes, indeed. A challenging critique, to be sure, but having just finished Metaxas’s book, I must say I’m baffled by some of the criticisms regarding what Metaxas purportedly left out. I’m wondering if this critique does not succumb to the same problem that Metaxas is accused of—ignoring texts to suit the historical thesis. It is no small matter that Metaxas’ book is liked by people who are not well acquainted with Bonhoeffer but strongly disliked by those who know him best. The problem is simply that Metaxas portrays a very attractive Bonhoeffer with surprisingly little regard for reality. The list of completely inexcusable blunders is very long indeed, only some of which are mentioned by Barnett. To add just one more: Had Metaxas done any of his historical homework, he would not have written that Hitler was elected to be Chancellor. It was an appointed position, with the appointment made by the President (Hindenburg) and needing no other authorization.